In a recent prospective study of black men, a group at high risk of both vitamin D deficiency and prostate cancer, it was found that serum vitamin D binding protein was inversely associated with prostate cancer risk independent of 25(OH)D status. 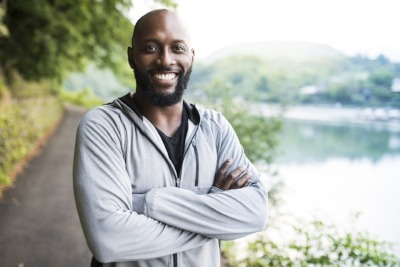 This study was part of the Prostate, Lung, Colorectal, and Ovarian Cancer Screening Trial (PLCO) that studied 678 black men who were part of this trial. It is the high melanin content that reduces the synthesis of vitamin D3 from 7-dehydrocholesterol when exposed to ultraviolet B radiation that increases the chance of black men having a low vitamin D status. This is also compounded by the fact that black men tend to have a lower dietary and supplemental intake of vitamin D.
In the study, out of the 678 black men participating, 226 of the men had prostate cancer, (101 were aggressive cases and 125 were nonaggressive). The men with prostate cancer had been matched with 452 men who were the controls by age at randomization, date of blood draw, calendar year of cohort entry, and time since baseline prostate cancer screening. In the body, vitamin D undergoes two steps. One is in the liver where 25-hydroxyvitamin D (25(OH)D), the accepted biomarker of vitamin D status, is synthesized and secondly, in the kidneys where the biologically active form, 1,25-dihydroxyvitamin D (1,25 (OH)2D) is produced. Approximately 99% of 25(OH)D is bound to serum proteins which is mainly vitamin D binding protein (DBP) which leaves a very small amount of unbound or “free” 25(OD)D.
What was found was that serum 25-hydroxyvitamin D was not associated with an overall increased prostate cancer risk but serum vitamin D binding protein was significantly inversely associated with prostate cancer risk.